Oh no, we’re not done with Chinese slider phones just yet. Following the Xiaomi Mi Mix 3 and Honor Magic 2, today Lenovo unveiled the Z5 Pro which is another notch-free Android slider made for China, but with the main difference being its price point — starting from about $290 instead of $475 and above. This is mainly due to the fact that the device houses Qualcomm’s mid-range Snapdragon 710 chipset, but you still get a 6.39-inch 2,340 x 1,080 AMOLED screen, in-display fingerprint reader, 6GB of RAM, a 3,350 mAh battery, dual Nano SIM slots and NFC. There’s also Dolby Atmos support through both speakers, but for wired headphones, you’ll need to plug in the bundled USB-C to 3.5mm adapter. On paper, the cameras shouldn’t be too bad, either. The rear module — which reminds me of Sony’s XZ2 Premium — consists of a 16MP 1.22um f/1.8 main camera plus a 24MP 0.9um f/1.8 secondary camera — the latter is for AI-enhanced low-light photography using pixel binning, in order to mimic a 1.8um sensor. You still get up to 4K video capture, but there’s no super slow motion mode here. 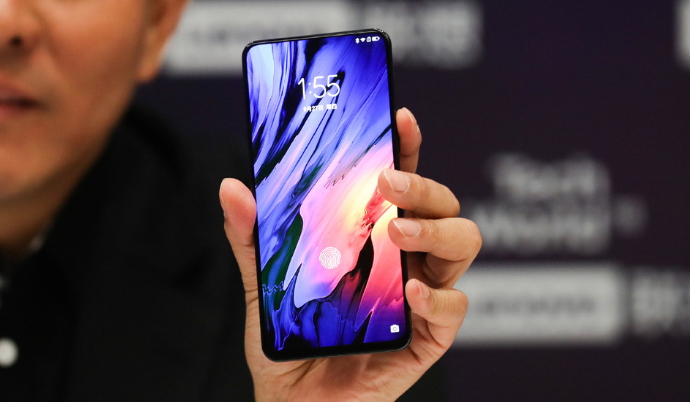 With the screen down, you’ll see the Z5 Pro’s 16MP f/2.2 front-facing camera along with an 8MP infrared camera, with the latter claiming to offer a more accurate facial recognition than the lower-resolution infrared cameras used by the few competitors. But of course, you can always just use the in-display fingerprint reader. What’s weird is that the earpiece here is sandwiched between these two front cameras instead of being at the top, and since there is no audio passthrough on the screen, you have to slide the screen down every time you make a call. Even though the screen looks nice without the earpiece slit along the top edge, this is still a strange sacrifice to make in terms of convenience. What I’m also unsure of is whether this “double helix structure” sliding mechanism is as good as the ones implemented by the Z5 Pro’s direct competitors. But at 9.3mm thick, this Lenovo is definitely the thickest of the three sliders, though it’s also the narrowest thanks to its 73.04mm width. Lenovo is already taking pre-orders for the Z5 Pro today, with the 64GB version going for 1,998 yuan or about $290, and the 128GB version for 2,298 yuan or about $330. But again, this phone isn’t very US-friendly — its LTE bands are mostly for Asia and Europe, so you’ve been warned.